A NEW PEACE CONSTITUTION FOR ICELAND? 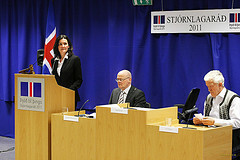 Following Iceland's 2008 economic meltdown and collapse of its banks and institutions, the government decided to revise its constitution, notably with the aim of revisiting the questions of the separation between legislative and executive powers, regulating their responsibilities and creating avenues for direct public participation in the decision-making process. Iceland's current constitution was adopted in 1944 when the country gained independence from Denmark. Instead of asking its citizens to approve the new constitution through a referendum at the end of the process, the government has sought to involve Icelanders in the drafting process from the beginning, in order to create a document by the people, for the people. In order to do so, Iceland has opted for an unprecedentedly creative, inclusive, and transparent exercise of direct democracy. The process started last year with the holding of a National Forum on the Constitution held on November 6, 2010, in which 950 randomly selected citizens, representing no one but themselves, were invited to brainstorm and share their ideas on the core values, vision and elements the new constitution should include. Eight themes were identified at the National Forum, including: Country and Nation; Morality; Human Rights; Justice, Wellbeing and Equality; The Nature of Iceland, Conservation, Utilization; Democracy; Division Of Power, Responsibility And Transparency; And Peace And International Cooperation. A Constitutional Council was formed on 6 April, 2011 and started its work based on the outcomes of the National Forum. All of its meetings have been open to the public and streamed live on to the Council's website and on its Facebook page. Further, weekly updates of the draft clauses have been posted online and citizens have been invited to send their feedback and comments on the draft text through social media. As the Constitutional Council is entering the last stages of its drafting process (it is due to complete the draft Constitution no later than by the end of July 2011), Peace Boat, acting as the Secretariat of the Global Article 9 Campaign, submitted a letter to the Council. Iceland shall be without an army and free of nuclear arms. Recalling that "104 states across the five continents have incorporated the value of peace in their constitutions" and citing existing clauses that explicitly recognized peace as a fundamental rights of peoples and individuals, such as in the constitutions of Japan, Bolivia and Colombia, the letter invited the Constitutional Council to "seek inspiration in other countries' constitutions and to explicitly include a peace clause in the new Constitution of the Republic of Iceland." "We want to promote peace, security, peace and happiness among us and future generations. We determined that we work with other nations for peace and respect for the earth and all humanity." Article 28 of the draft constitution states that "Military service is not law. The Global Article 9 Campaign welcomes the inclusion of the values of peace and sustainability in the draft Constitution. On July 29, the Constitutional Council presented the draft Constitution to the President of the Parliament in Reykjavik. Visit the Constitutional Council's website here and its Facebook page here. Read Peace Boat's letter to the Constitutional Council here. Find a Summary from the themes identified at the National Assembly 2010 on the Constitution here. On June 17, 2011, the Cuban delegation convened an informal consultation of the Human Right Council on the Human Right to Peace, during which a draft resolution on the "Promotion of the right of peoples to peace" [A/HRC/17/L.23] was put forward for a vote. The resolution notably "reaffirms that the peoples of our planet have a sacred right to peace; ...that the preservation of the right of peoples to peace and the promotion of its implementation constitute a fundamental obligation of all States; ...[and] emphasizes that ensuring the exercise of the right of peoples to peace and its promotion demands that the policies of States be directed towards the elimination of the threat of war, particularly nuclear war, the renunciation of the use or threat of use of force in international relations and the settlement of international disputes by peaceful means on the basis of the Charter of the United Nations." The document also "takes note of the progress report of the HRC Advisory Committee on the right of peoples to peace (A/HRC/17/39), which include more than 40 possible standards for inclusion in the draft declaration on the right of peoples to peace"; "supports the need to further promote the realization of the right of peoples to peace and, in that regard, requests the Advisory Committee, in consultation with Member States, civil society, academia and all relevant stakeholders, to present a draft declaration on the right of peoples to peace, and to report on progress thereon to the Council at its twentieth session"; and finally "requests the OHCHR to retransmit the questionnaire prepared by the Advisory Committee in the context of its mandate on the issue of the right of peoples to peace, seeking the views and comments of Member States, civil society, academia and all relevant stakeholders". Speaking on behalf of the European Union members in the Council, Hungary explained that, while the EU "supports some of the principles set out in this draft resolution and recognizes the linkage between peace and enjoyment of human rights,.... the draft resolution omits to state that the absence of peace cannot justify failure to respect human rights." Further, it found problematic the fact that the draft "deals almost exclusively with the relationship between states and not with the relationship between the state and its citizens and the state's respect for human rights, which is the core mandate of [the Human Right] Council" and recommended that the issue be "better dealt with in other fora" - such as the UN Security Council. Echoing the EU position, the Japan Ministry of Foreign Affairs expressed similar reservations in an informal meeting with NGOs held in Tokyo on July 15 in the context of the NGO committee of UN Reform Public Forum aimed at exchanging views on the Japanese priorities towards the upcoming UN General Assembly. Seizing the opportunity to challenge their government's position on the question of the Human Right to Peace, civil society representatives emphasized the importance of Right to Peace and its connection to the right to live in peace provided in the Preamble of Japanese Constitution, and recalled that the constitutional right to live in peace was affirmed in the 2008 Nagoya High Court ruling over the legality of the SDF dispatch to Iraq. Some government officials present at the meeting, however, expressed doubt about the collective nature of the right to peace and insisted that the Right to Peace is not yet an universally recognized concept. At the UN in Geneva, the Advisory Committee will continue to work on the draft declaration. Further discussions in the Human Right Council will take place during its seventh session (in August 2011) and at its eighth session (in February 2012), before a finalized draft declaration is presented to the Human Rights Council at its twentieth session (in June 2012). Read Resolution A/HCR/RES/17/16 on the right of people to peace here. Find explanation of votes on UN webcast here. Also read the Civil Society submission to the questionnaire circulated by the Office of the High Commissioner for Human Rights in the context of the international consultations undertaken by the Human Rights Council Advisory Committee on "possible elements for a Draft Declaration on the Right to Peace" here. "A major shift in Japan's energy policy is necessary to wean our society off nuclear power generation as soon as possible," states the Asahi Shimbun - one of Japan's most circulated newspapers - in a series of five editorials that seek to generate a public debate and to explore how Japan can transition from its nuclear power dependency to a "zero nuclear power generation society". On July 13, Prime Minister Kan Naoto announced in a televised news conference that Japan "will aim at realizing a society which can exist without nuclear power." According to a survey carried out by the newspaper following the March 11 earthquake, tsunami and subsequent nuclear catastrophe in Fukushima, 77% of respondents favor a "phased decommissioning of nuclear power plants." With experts assessing that Japan - a country located in a zone highly prone to major earthquakes - has entered a period of increased seismic activity and given that Fukushima has demonstrated the challenge of shutting down power plants in time of crises, it has become urgent for the country to find alternatives to nuclear energy. In a country relying on nuclear energy for 30% of its power needs (and which was targeting to increase that figure to 53% by 2030 prior to the Fukushima crisis), a gradual approach is necessary to substitute Japan's reliance on nuclear energy, and efforts need to be made to develop affordable, renewable alternative energy sources. The life span of a nuclear reactor is usually of 40 years. If Japan stops building new reactors and shut down its existing ones after 40 years of operation, and if the government does not approve extension for operating them as it did for the Tsuruga and Mihama Nuclear Power Plants, Japan's total nuclear power generation capacity will fall by 20% in 2021; by 50%in 2029; and all reactors will be gone by 2050 - "too slow" of a pace "toward a nuclear-free future" according to the Asahi. Realistically "[t]he process of decommissioning a reactor, however, will take 20 to 30 years," concedes the newspaper - a timeframe that should be used to mainstream the utilization of renewable energy sources, which have so far been neglected, representing a mere 1% of Japan's use of energy sources. Despite the lack of policy support to develop renewable energy, the Environment Ministry estimates that "wind power available in Japan could potentially generate as much electricity as seven to 40 nuclear reactors combined." Likewise, reminds the Asahi, "[u]ntil several years ago, Japan led the world in terms of both installed solar power capacity and production of solar cell panels." Though it is no longer the case today, with Germany and Spain ranking above Japan in solar power capacity, Japan remains in a very good position to exploit and mainstream wind and solar power. Other possible sources of renewable energy are the country's volcanoes and large forests, which could be used to produce geothermal and biomass energy. The newspaper even mentions the possibility of exploring the potential of "blue energy", using ocean's currents and waves to generate power. A UN Panel of Experts on Climate Change states that "renewable energy sources could provide up to 77 percent of the world's energy needs by 2050." Criticizing the role played by the Japanese government in encouraging a system by which power companies monopolize regional operations and undermine the worth of renewable energy, the Asahi Shimbun advocates for a radical overhaul the current system, based on deregulation of the energy market and "smarter and more efficient use of electricity, with conservation as its centerpiece," and envisions a society in which "consumers will examine the costs and risks involved in various power generation methods, select power sources on their own and shoulder the burden of necessary costs." The Fukushima crisis has built momentum about the need to find new energy sources. "It is time for Japan to reinvent its energy policy," concludes the Asahi Shimbun. "In fact, this is Japan's responsibility to the international community." Becoming a nuclear power-free country would indeed be the most constructive way for Japan to respond to the Fukushima tragedy. Based on the country's past records in term of technology innovation, and with the support of the international community, Japan could become a leader in the development and mainstreaming of technology for clean and safe energy ensuring the sustainability of the planet. 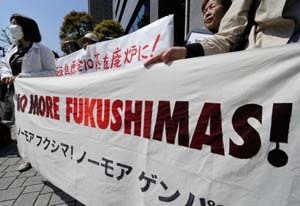 Furthermore, the Global Article 9 Campaign believes Japan's move towards reducing its reliance on nuclear energy could have positive implications on peace and cooperation in the East Asia, as it would need to be accompanied by alternative energy and resource cooperation among countries in the region towards a peaceful and mutually beneficial sustainable future in Northeast Asia. Read the Asahi Shimbun series of editorials here: Part 1 , Part 2 , Part 3 , Part 4 and Part 5. From August 15 to 21, The Frontiers is inviting peace activists from around the world to participate in an international peace camp in Gangjeong on Jeju Island, off the southern coast of the Republic of Korea, in solidarity with the villagers' struggle against the construction of the naval base. A large majority of the Jeju population opposes the construction of a 400,000 square meter naval base in the coastal waters of Gangjeong, listed by UNESCO as world heritage environmental sites. Villagers have undertaken peaceful resistance against the construction of the base, through legal actions and daily protests and demonstrations. Repression against protesters has been brutal and arrests have been deemed illegal. A statement of appeal to save Gangjeong has been issued by the National Network of Korean Civil Society for Opposing to the Naval Base in Jeju Island. On July 15, ROK police ordered a new crackdown on protesters and arrested key figures in the peaceful resistance to the naval base, including Brother Song Kang-Ho, the village mayor Kang Dong-Kyun, and base opposition leader Ko Kwon-Il. In addition, Minister of Justice Lee Gui Nam and the South Korean Navy issued a directive to 77 individuals and civil society groups banning them from getting into public waters or accessing the area where the naval base is being constructed. A few days later, on July 25, 1,200 policemen in riot gear were sent to Gangjeong village where villagers and activists continue their non-violent resistance. 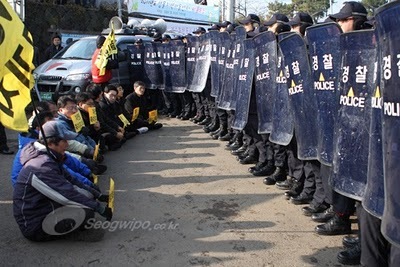 As tension is rising in Gangjeong, there is a need for more international peace volunteers to join the peaceful resistance, witness the repression against villagers protesting against the construction, stand together with local activists and contribute to raising a non-violent voice against the naval base. As part of the peace camp, various activities will be held, including story-telling workshops on Gangjeong village, lectures by peace activists, meditation, traditional art creation, demonstration against the naval base, film festival, concerts and more. The Frontiers is a Korean network of peacemaking communities aiming to give support for rehabilitation and hope for peace, with a focus on peace building, reconciliation, and community living. Application can be found here and must be submitted to tfjeu@gmail.com no later than August 6, 2011, by 5 p.m. The participation fee is 130,000 KW (approximately $130 USD), plus transportation. More information about Jeju International Peace Camp 2011 can be found here. Read the National Network of Korean Civil Society for Opposing to the Naval Base in Jeju Island's Statement : "We appeal to save Gangjeong!" here. Sign an online petition addressed to South Korean President Lee Myung Bak through Avaaz.org here. For more information about Jeju Island and the protest movement against construction of the Gangjeong naval base, visit Save Jeju Island's website here. 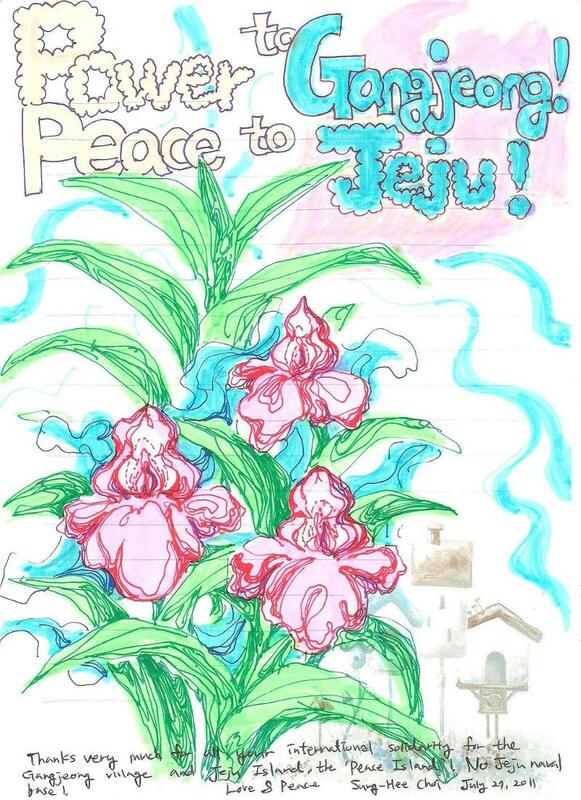 Drawing by renowned imprisoned activist Sung-Hee Choi. The text reads: "Thank you very much for all your international solidarity for the Gangjeong village and Jeju Island - the 'Peace Island'! No Jeju naval base! Love and Peace. Sung-Hee Choi. July 21, 2011"
The Peace Portal has just launched a worldwide contest for the peacebuilding community: the "Stories of Peace" Challenge. You are invited to share your story and experiences on peace and preventing conflict and tell us about initiatives in your part of the world. The 25 best stories will be published in "People Building Peace 2.0" and winners receive ten copies of the book. One of these winners will be offered customized features and professional services on the Peace Portal, worth € 500,-, for free! The Peace Portal is an open platform, which accumulates, integrates and analyses information from civil society and grass root organisations from conflict areas and makes it available to an audience of varying interests and expertise. With this information, the Portal intends leading to action aimed at preventing conflict and building peace. An initiative of the GPPAC Foundation, the Peace Portal promotes non-violent and peaceful solutions by being impartial, open, accessible, respectful, trustworthy, transparent and supporting freedom of expression. Submit and share your story on the Peace Portal before August 31st 2011! To do so or to get more information on the challenge click here.